In this fourty-ninth archive story by Kristian Bertel, you will get a closer look at the bathing ghats in Pushkar. This holy city is located in the state of Rajasthan. Read the background story of this archive photo by the photographer. Pushkar and its light blue houses are a stunning scenery when arriving for the first-timers in this cozy and colorful town. The particularity of this sacred city of about 25,000 inhabitants is certainly the Brahma Temple. It is to be the only one in India and even worldwide. Besides, there is nowhere else such a density of temples as in this place. Pushkar is a holy town in the state of Rajasthan famous for the Pushkar lake, various ghats and temples spread all around the lake. The word 'Pushkar' means lotus flower, which is said to be the seat of Brahma, one of the Hindu holy trinity, who is worshipped as the creator of this world. The legend has it that the demon Vajra Nabha took the lives of Brahma's children, he in turn struck him with his weapon, a lotus flower. Vajra Nabha died with the impact, and the petals of the lotus fell at three places. One of them is Pushkar, where it gave birth to a lake. Brahma is supposed to have performed sacrifice at this lake on Kartik Purnima, which is the full moon day of the Kartik month, which generally falls in November, hallowing the place. Though Brahma is considered to be the creator of the world, Pushkar is the only temple of this important deity in the whole world. This is also considered as Adi Teerth or Teertharaj meaning ancient holy place or the most important of holy places respectively. Shiva who is 'the Destroyer' and Vishnu who is 'the Preserver' are, alongside Brahma who is 'the Creator', the three main male gods or principles of Indian mythology. According to legend, one day, when he flew over the earth on his riding animal, Wildgans Hansa, Brahma discovered that he had no place of residence on earth. So he went to the search and dropped three lotus blossoms to the ground. Where the blossoms touched the ground, three springs sprang up directly in the middle of a sand desert, which, among other things, caused the sacred Pushkar lake. Brahma then fell into deep meditation at this place and named this place Pushkar, which means lotus. After this meditation, Brahma wanted to return to his heavenly chambers. The other gods, however, demanded that he still perform a sacred ritual on earth. As the date the last five days of the month before the full moon in the month of Kartik were determined. Many gods and saints came to the celebration, and Saraswati who is the wife of Brahma was to participate in the ritual. However, the messenger who was to bring them back came back with the lie that Saraswati had no time to attend. Since Brahma had no woman, an essential part of the ritual, he soon married a young, handsome shepherdess. Shortly after the ceremony had begun, Saraswati appeared with her entourage and cursed her apostate husband. Except one day a year, Brahma should not be worshiped in any temple or any holy place on earth. When she said this curse, she sadly withdrew to a nearby hill on which the temple consecrated to her is still standing today. Because of this curse, the Brahma Temple in Pushkar remains the only one in India. As used in many parts of Northern South Asia, the term ghat refers to a series of steps leading down to a body of water, particularly a holy river. In Bengali-speaking regions, this set of stairs can lead down to something as small as a pond or as large as a major river. Ghats such as these are useful for both mundane purposes, such as cleaning and religious rites for instance ritual bathing or ablutions, there are also specific Shmashana or 'cremation' ghats where bodies are cremated waterside, allowing ashes to be washed away by rivers. 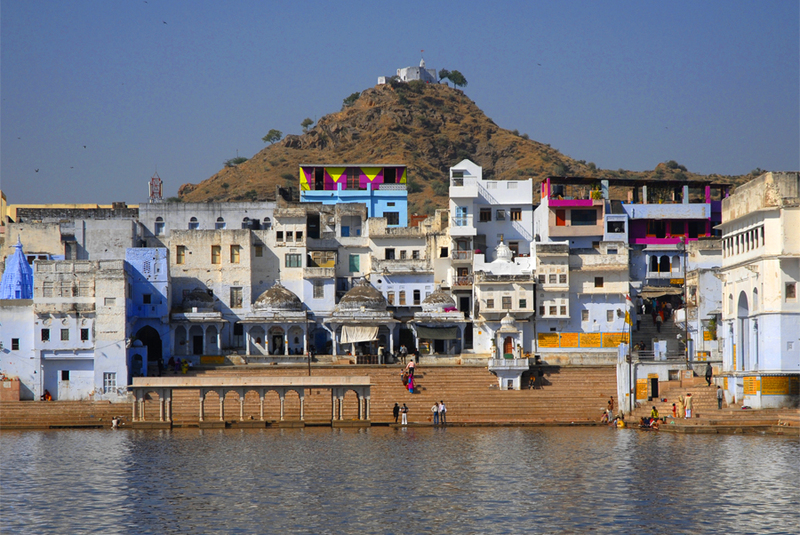 Pushkar Lake is a beautiful, sanctified spot in the center of Pushkar. It is said to have been created by Lord Brahma and is therefore a place of pilgrimage for the Hindus. The lake is surrounded by 52 different ghats, or series of steps, which Hindus use to descend to the lake for ritual bathing, especially in the month of Karthik. A lake is an area of variable size filled with water, localized in a basin, that is surrounded by land, apart from any river or other outlet that serves to feed or drain the lake. Lakes lie on land and are not part of the ocean, and therefore are distinct from lagoons, and are also larger and deeper than ponds, though there are no official or scientific definitions. Lakes can be contrasted with rivers or streams, which are usually flowing. Most lakes are fed and drained by rivers and streams. India is a land full of stories. On every street, on every corner and in the many places in India, life is rushing by you as a photographer with millions of stories to be told. In the archive story above, you hopefully had a readable insight in the story that was behind the photo of a bathing ghat in Pushkar. On this website of Kristian Bertel | Photography you can find numerous travel pictures from the photographer. Stories and moments that tell the travel stories of how the photographer captured the specific scene that you see in the picture. The photographer's images have a story behind them, images that all are taken from around India throughout his photo journeys. The archive stories delve into Kristian's personal archive to reveal never-before-seen, including portraits and landscapes beautifully produced snapshots from various travel assignments. The archive is so-far organized into photo stories, this one included, each brought to life by narrative text and full-color photos. Together, these fascinating stories tell a story about the life in India. India, the motherland to many people around the world, a land of unforgetable travel moments. The archive takes viewers on a spectacular visual journey through some of the most stunning photographs to be found in the photographer's archive collection. The photographer culled the images to reflect the many variations on the universal theme of beauty and everyday life in India. By adding these back stories the photographer's work might immensely enhanced the understanding of the photographs.